In just over a month, you will have experienced one of best weeks of your life at Freshers’. You will have partied across Southampton’s biggest venues in Bedford Place during Bloc Party, had foamin’ fun at our official Freshers’ Foam Party and most importantly, you will have kicked off uni with 6,000 other likeminded students! If that isn’t enough, this year, we have thrown in a true gem to the Freshers’ 2016 calendar. Forget Glastonbury and Reading, this year it’s all about the day festival. You can leave behind muddy wellies and wet wipe washes – Southampton Soundclash is the festival for the Fresher! Expect headliners Andy C (2hr set), Groove Armada (DJ set), Jamie Jones, Pendulum (DJ set & verse) and Groove Armada, plus loads more! 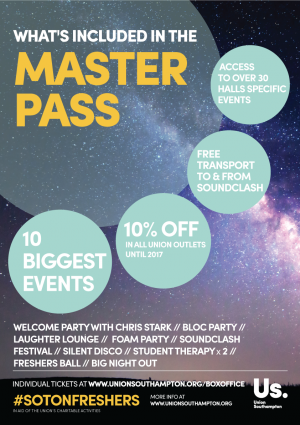 ✔ Included in our Freshers’ Master Pass – Tickets to Soundclash are usually between £40-£60 (depending on the release), but they work out as just £15 with the Master Pass. ✔ FREE transport to and from the festival with our Freshers’ Master Pass – We know that not everyone will have a car at uni, so we’ve even sorted you free lifts. ✔ Day festival – If camping isn’t your thing, don’t worry! You don’t have to be all about the gear and no idea! Just wear your favourite, most comfortable clothes and get partying! ✔ The ultimate student festival – University of Southampton and Southampton Solent students usually make up the crowd. ✔ Fun AND safe – Our official partners organise Soundclash, so you can festival with confidence. ✔ A chance to make new friends – You will already have had a week at uni before Soundclash, so you will have plenty of time to make friends to go with. Also, don’t forget that you have the bus ride there to bond some more.